South Suburban College will host an Open House for the Court Reporting/Verbatim Technology Program on Thursday, May 9th. This event will be from 7:00 p.m. – 8:30 p.m. at the Oak Forest Center. Court reporting is an interesting, challenging profession which offers a wide-open job market, flexible work schedule, and excellent income potential ($64,672 average income). 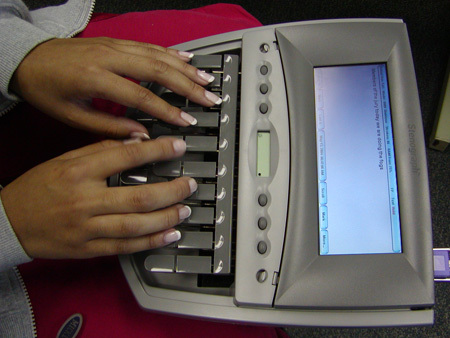 Sophisticated technology has created exciting work in closed captioning and stenointerpreting. Broadcast captioners can earn $70,000+ and may work out of their homes. South Suburban College’s NCRA-approved program is the only court reporting program in the south suburban region! All of SSC’s Court Reporting classes are held at the Oak Forest Center (OFC). For more information, please contact LaTherese Cooke, Program Coordinator, at (708) 596-2000, ext. 3217, or visit www.ssc.edu for a complete listing of upcoming open houses.